Image Data Compression: Introduction. Psychovisual Considerations. Signal Properties--The Influence of the Coding Algorithm. The Test Pictures. Plan of the Book. Guide to the Literature. Intraframe Predictive Coding: Introduction. Basic Relationships in Predictive Coding. Determination of Predictor Coefficients. Quantization of the Error Sequence. Adaptive Techniques. Other Developments. Concluding Remarks. Intraframe Transform Coding: Introduction. The Transform Coding Operation. Basic Transform Properties. Two-Dimensional Forward and Inverse Transformation. A Measure of Transform Efficiency. Transform Coefficient Processing. Transform Coefficient Distributions and Classical Bit Allocation. Adaptive Intraframe Transform Coding. Perceptual Considerations. The Still Picture (JPEG) Coding Standard. General Remarks. Intraframe Vector Quantization: Introduction. Basic Considerations. Codebook Design. Codebook Search. Other Approaches to the Vector Quantization Design/Implementation Problem. General Comments. Intraframe Sub-Band and Wavelet Coding: Introduction: Sub-Band Coding. Basic Principles. Sub-Sampling and Interpolation. The Filtering Problem. Two-Dimensional Extensions. Edge Effects. Practical Sub-Band Coding Schemes. Introduction: Wavelet Coding. Basic Principles of Wavelets. Multiresolution Wavelet Analysis. Extension to Image Processing. Practical Wavelet Coding. Discussion. Other Intraframe Techniques, One: Segmented, Block-Truncation, and Fractal Coding: Segmented and Two-Component Coding. Block-Truncation Coding. Fractal Image Coding. Other Intraframe Techniques, Two: Quadtree, Multiresolution, and Neural Approaches: Quadtree and Recursive Coding. Multi-Resolution Coding. Neural Techniques in Image Coding. Interframe Coding: Introduction. Interframe Predictive Coding. Interframe Frequency Domain Approaches. Hybrid Transform Coding. Motion and Motion Compensation: Introduction. Early Approaches to the Problem. Element Recursive Techniques. Block Matching Motion Estimation. Correlation Techniques. Hierarchical Techniques. Motion Compensated Interpolation. General Motion. Other Considerations. General Comments: How Efficient is Motion Compensation? Standards for Image Sequence Coding: Introduction. CCITT Recommendation H261: Video Codec for Audiovisual Services at p<$> x 64 kbs<+>-1<$>. MPEG-I. MPEG-II. Alternative Schemes for Image Sequence Coding: Introduction. Interframe Vector Quantization. Interframe Sub-Band and Wavelet Coding. Segmentation in Image Sequence Coding. Hierarchical/Recursive Schemes for Interframe Coding. Model-Based Coding. Image Transmission and Error Control: Introduction. Fixed Rate Transmission. Variable Rate Transmission.Appendix I: Variable Length Coding. Appendix II: The Future--Very Low Bit-Rate Video and MPEG-IV. References. Subject Index. Spectacular advances during the last decade have altered the related disciplines of computing and telecommunications beyond all recognition. The developments in the"enabling technologies,"which have made these advances possible, have been less obvious to the casual observer. 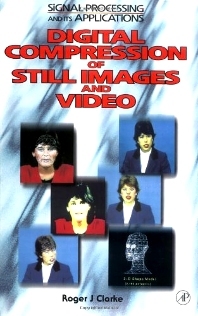 The subject of this book is one of these technologies--the coding of still images and picture sequences (video). Digital Compression of Still Images and Video is general in approach and covers all the recognized coding algorithms; explaining their basic theory in enough detail that the reader will understand the principles involved. Results which have been achieved with coding algorithms by researchers in all parts of the world are also discussed. A brief historical review of the area is included to orient those new to the field, and the work is supported by references spanning the period from the earliest work on time/frequency analysis, to the latest topic of research interest--image sequence transmission using asynchronous transfer mode (ATM) techniques. This book will make an excellent reference for graduates and researchers working on image coding and transmission, and will also be of use to those in the related areas of computer vision and multimedia developments. It is essential reading for the rapidly increasing number of technical and professional staff in the industrial environment who, maybe for the first time, are coming to grips with image coding. Graduates/researchers in image coding, data communications and those in AI specializing in vision. Also, professionals using image coding in wider and multimedia technologies.